The Belfast-built H.M.S. Titanic was thought to be unsinkable after it set sail from Cobh, Co. Cork, on its fated maiden voyage. Of the roughly 2,220 people aboard the Titanic, around 164 were Irish, only 54 of whom were found amongst the ship’s 700-some survivors. Its wreckage lay undiscovered until September 2, 1985, and now on the 30th anniversary of the discovery several Titanic artifacts will go on auction, and are likely to sell for hefty sums. The items come from Abraham Lincoln Salmon, who was one of the 12 survivors on the infamous Lifeboat No. 1, nicknamed the “money boat” due to unsubstantiated allegations that these survivors bribed the crewmen to paddle away from danger while others struggled to survive. 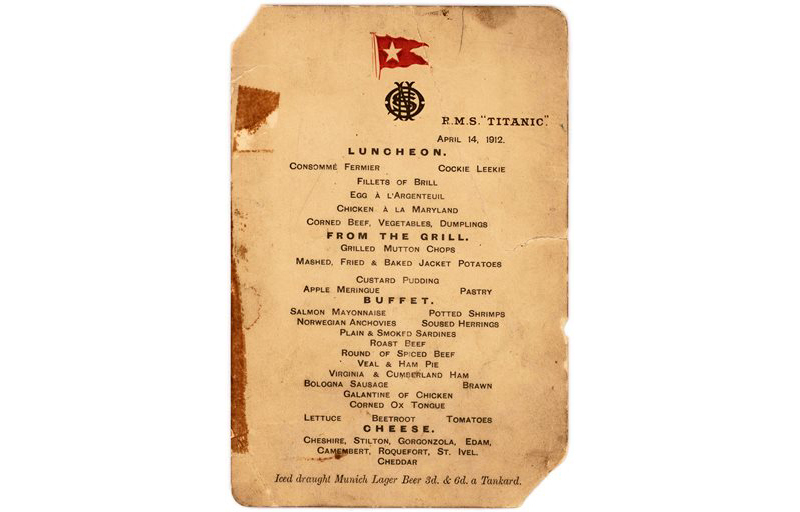 The most coveted item to be auctioned is the menu for the last lunch served on the Titanic, of which only a few are thought to remain in existence. The crumpled artifact is estimated to fetch $50,000 or more. Salmon also saved his ticket from a special chair found in the ship’s Turkish Baths used to determine a passenger’s weight. This item is just one of four in existence, and is likely to go for around $10,000. Inscribed on this ticket are several names of the other survivors from Lifeboat No. 1. The final item is a letter penned six months after the disaster. It was sent to Salmon from Laura Mabel Francatelli, who was also in Lifeboat No. 1.